To avoid pink or excess of color tendency that can be observed in the video after power on, when the picture mode is set to standard in some specific cases (France). The remote control and the front panel buttons may stop to operate, after a while, depending on the type of event information or the parameters of the signal which is been broadcasted (France). To avoid TV to stop operate due to many channels being transmitted (Italy). To fix some problems related to the use of CAM required for Mediaset contents (Italy). To avoid a delay between sound and picture in some channels (Spain). Avoids TV locks while zapping between some services. Fixes spelling mistakes in “Subtitle Language” and “Display Area” menu options. Fixes subtitles problems in Latvian services. Adds support for audio and video for encrypted MPEG4 services. Fixes audio problems in analogue Stereo services. Avoids TV always powers on in analogue programme number 0. Information in banner was not correct when 24 hour EPG events were used by the broadcaster. Added support for ‘cross carried’ event information. Added support for subtitles on HD DVB-T services. Improved auto format detection for set top boxes. Revision of specific Polish characters for event information. Improved readability of teletext subtitles. Improved robustness due to DVB transmission errors. Please note that after the update is completed, an auto tune is required. Power on the TV set and press the MENU button on the Remote Commander to display the Home Menu. Navigate to the 'Settings' option and press OK to select it. Navigate to the 'Set-up' option and press OK to select it. Navigate to the 'Digital Set-up' option and press OK to select it. Navigate to 'Technical Set-up' option and press OK to select it. Navigate to 'System Information' option and press OK to select it. The version number is shown on the first line. When the update download is complete, check that the file size is 23.262.984 bytes. Open Windows explorer, locate the downloaded file 'firmware.upd' and copy the file to the root of your USB device. Insert your USB device containing 'firmware.upd' into the USB slot of the TV set. Press MENU on the Remote Commander. Press to select “Settings” and press . Press to select “Set-up” and press . Finally, press to select “System Update” and press . If the version number shown on the first line is M5.167, your TV set has been correctly updated. 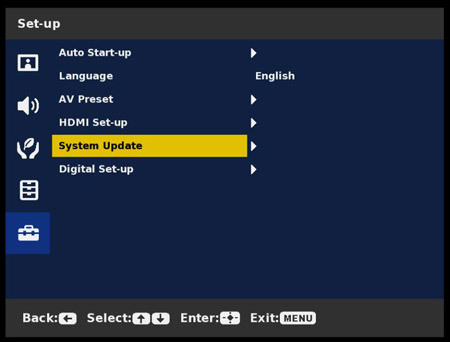 "Update data of newer version is not detected" is displayed on the TV front panel display.